NHT, which stands for Now Hear This, has been producing loudspeakers since 1986. The Benicia, CA company has undergone a few changes through the years: Founder Ken Kantor left to develop professional monitor speakers under the Vergence Technology brand name, and International Jensen bought NHT a few years back and was then sold to Recoton. Despite all the flux, NHT has remained true to its original vision of producing high-value loudspeakers possessing sonic accuracy, imaging precision, and impressive dynamic range. In NHT's new Super Audio line, the SB1 is the smallest and least expensive speaker the company makes. It replaces NHTs highly regarded SuperZero loudspeaker. The SuperZero was prized for possessing clarity and spaciousness that embarrassed more expensive loudspeakers -- it was a real high-end monitor, lacking only bass. The SB1 has big shoes to fill. The SB1 has two drivers -- a 1" aluminum-dome tweeter and a 5.25" polypropylene woofer. Around back, the SB1 has a single pair of high-quality gold-plated five-way binding posts. The front grilles are removable. The SB1 is noticeably larger than the SuperZero, but its still compact, measuring 6.75"W x 6.25"D x 10.25"H. The cabinet is a sealed, acoustic-suspension design, so it differs from most of its competitors, which tend to be tuned-port designs. The cabinet's finish consists of seven coats of black lacquer, resulting in a high-gloss piano-like sheen. The corners of the cabinet are rounded, giving the SB1 fit'n'finish that put many of its rivals to shame. I auditioned the NHT SB1 in my audio room, which measures 14 x 20 x 8 in size. I set them up in accordance with NHTs recommendations, which suggest the speakers be placed 1.5 times as far from the listener as they are from each other. With the speakers six feet apart, I placed my listening chair nine feet feet away from the plane in which they were sited. Both SB1s were well away from the front wall, approximately two and a half feet into the room, and about four feet from the side walls. The speakers were placed on 30"-high stands so that the tweeters were at approximately ear level. I listened to the NHT SB1 using my usual two-channel rig, consisting of an Arcam Delta 290 integrated amplifier, a Pioneer PD-65 CD player, and a Rega Planar 3 turntable with a Grado Prestige Silver cartridge. Speaker cables and interconnects were Sonic Horizon Hurricane. I also listened extensively to the SB1 with my subwoofer, the Denon DSW-10, and NHTs matching subwoofer, called the SW10. One of the SB1's most obvious traits is its clarity. This was particularly apparent with female vocals such as "Aint Got No Tears Left" from Leonard Bernsteins New York (various artists) [Nonesuch 2 79400]. Donna Murphys voice sounded very natural, with none of the artificial heaviness or boxiness that often plague budget speakers. When Murphy hit the high notes, the midrange smoothness extended nicely into the high frequencies. The smoothness of the high frequencies was evident on Diana Kralls "Lets Face the Music and Dance" from When I Look into Your Eyes [Verve IMPD-304]. Kralls voice has an airy quality to it, which was particularly admirable when played through the SB1. A second hallmark of the SB1 is its apparent accuracy. This accuracy can be a double-edged sword, because although it will reveal just how great your best recordings can sound, it will unmask your poor recordings, especially older CDs. For example, on "Cancer" from Joe Jacksons Night and Day [VPCD-4906], my ears were hurting from the high-frequency harshness of the CD mastering. In contrast, the vinyl version of the same recording is a pleasurable listening experience through the SB1. On Stepping Out [JUST 50-2], Diana Kralls voice is slightly veiled throughout this otherwise decent work. The SB1 easily portrayed this characteristic of the recording. On the superb-sounding Give it Up to Love [JVCXR-0012-2], Mighty Sam McLain's voice sounds warm, detailed and full, just as it does on my four-times-more-expensive NHT 2.5i. 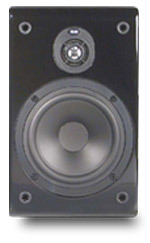 The SB1 produced a large, well-defined soundstage. On "Ganges Delta Blues" from Ry Cooders and V.M. Bhatts A Meeting Across the River [WLA CS-29-CD], Ry Cooder can be heard slightly outside the left speaker, V.M. Bhatt slightly outside of the right speaker, with Joachim Cooder and Sukhvinder filling in the half-left and half-right positions in the soundstage. Each instrument is well focused within the soundstage, exactly as it should be. One of the SB1's most defining characteristic is that it does not, um, address much of the low frequencies. Thats right, the SB1 lacks bass weight, theres no two ways about it. Playing the pink noise from The Sheffield/A2TB Test Disc [Sheffield 10508], showed me that the SB1 does not produce much sound below 70Hz. However, you may get slightly more bass if you put the speaker closer to the wall or near a corner. The SB1s lack of low-bass performance might be a deciding factor for some listeners, since most of its rivals probably produce more bass. A positive aspect of the SB1s bass is that transients tended to have the right snap. On Stereophiles Test CD 2 [STPH 004-2], the acoustic drum solo on track three sounded very fast and dynamic. In addition, the drums throughout A Meeting Across the River sounded especially realistic, with each hand strike by Sukhvinder represented as a distinct sonic event. On "Peppermint Patty" from Wynton and Ellis Marsalis Joe Cools Blues [Columbia CK 66880], it was easy to picture the notes being plucked by bassist Reginald Veal, despite the SB1's overall lack of bass, since the instrument's upper harmonics were so faithfully replicated. Interestingly, despite the SB1's lack of bass power, its portrayal of Reginald Veal was not diminished, and listening to his performance remained a pleasurable experience. I teamed the SB1 with subwoofers in sub/sat systems with two different configurations. In one system, I used the NHT SW10, part of the Super Audio line. It is a fairly compact cube, measuring 14.5" in height, width, and depth. I used the speaker-level inputs from my amp to the subwoofer, and fed the SB1 with the speaker-level outputs from the sub. In this configuration, the signal feeding the SB1 is rolled off at approximately 100Hz, so that the SB1 is not called upon to reproduce any lower-frequency signals. In a second system, I connected the SB1 from my amplifier as I normally would, but I used the preamp outputs to feed my sub, a Denon DSW-10. In this configuration, the SB1 will see a full-range signal and the Denon sub fills in the missing bass. In either case, matching subwoofers to the SB1 was a fairly simple exercise. Because the SB1 reaches lower than the SuperZero, it was relatively easy to find a good crossover frequency with either sub simply using just my ears. The NHT SW10 was particularly straightforward, having been designed to work with the SB1. In either configuration, the subwoofers gave the SB1 nearly full-range sound. Listening to Jacky Terrason and Cassandra Wilson on Rendezvous [Blue Note CDP 7243 8 55484 2] through the NHT SW10, this was abundantly evident. On "Tennessee Waltz," the bass and the electric piano were reproduced fully, the system sounding significantly warmer than without the subwoofer. Although the NHT SW10 provided excellent bass response and was a good match for the SB1, at times the subwoofer did not match the reproduction of transients of the SB1. Thats not to say that the bass from the NHT SW10 plodded along, but transients sometimes seemed a bit smeared. However, with the SB1 only reproducing music from 100Hz and up, the 5.25" woofer in the SB1 seemed to have extra snap. In the second configuration, with the Denon DSW-10, the SB1s proved to be an excellent match. This subwoofer seemed to mimic the transient response of the SB1. This was illustrated in the aforementioned "Peppermint Patty" from Wynton and Ellis Marsalis Joe Cools Blues. This high-tempo tune played by the Ellis Marsalis Trio has quick finger-plucked bass and tight drum whacks, which were smartly reproduced by the NHT SB1/Denon DSW-10 combo. I was having a lot of fun listening to this duet, and I hauled out CD after CD with good bass response, such as Tom Cochranes Songs of a Circling Spirit [EMI 72438 37239 0 4] and Holly Coles Temptation [Alert Z2-81026]. I had the SB1s predecessor, the NHT SuperZero on hand for comparison. Comparing the two speakers proved to be a surprising experience. I would never have called the SuperZero a dark-sounding speaker, but in comparison to the SB1, this proved to be the case. The SuperZero has what I would call NHTs characteristic airy high frequencies, which sound very similar to those of the NHT 2.5i. The SB1, while not in-your-face bright, nevertheless makes the SuperZero sound polite and subdued in comparison. The SB1, while lacking some of the SuperZero's airiness in the high frequencies, has a more revealing tweeter than the SuperZero. In terms of imaging, the SuperZero excels at providing a deep and wide front soundstage, which the SB1 approaches, but does not quite match. However, the SuperZero totally lacks any bass response below 100Hz, and the SB1, although bass challenged, will reach at least down to 70Hz. This slightly lower extension allows the SB1 to mate well with subwoofers, which is a notoriously difficult task to accomplish with the SuperZero. I also had the $275 Axiom M3Ti SE on hand for comparison. The Axiom provided enough bass response that I didnt feel I was missing much in the low frequencies. 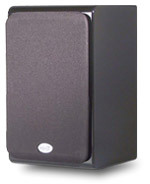 With the NHT SB1, a subwoofer was usually needed to fill in the missing lower to midbass. Although the SB1 isnt a power-hungry speaker, it was less sensitive than the M3Ti SE, and needed a noticeable volume increase to match the sound levels of the M3Ti SE. Listening to each speaker with a subwoofer narrowed the differences substantially. With each speaker relieved of producing bass, the NHT SB1 excelled in transient response. The plucked bass notes at the beginning of "Linus and Lucy" from David Benoits Heres to You, Charlie Brown: 50 Great Years! [GRP 314 543 637-2], sounded more distinct and precise with the NHT SB1 as compared with the Axiom M3Ti SE. In terms of high-frequency response, both speakers sounded similar, with the NHT SB1 having a slight bite to the treble. This can be illustrated in the brass section at the beginning of "Ding-Dong! The Witch is Dead" from the Harry Connick, Jr. CD entitled Songs I Heard [Columbia CK 86077]. What I can conclude after listening to both sets of speakers is that each excels in different environments. The Axiom is a more forgiving speaker, sounding good with a receiver, with or without a subwoofer. The NHT SB1, on the other hand, sounded its best with higher-end electronics and a subwoofer. The NHT engineers were faced with the difficult task of replacing the standard in the affordable mini-speaker class, the NHT SuperZero. By wiping their slate clean, the design team was able to rectify the main deficiency of the SuperZero -- its lack of response below 100Hz. Although the SB1 is the successor to the SuperZero, these two speakers really have nothing in common other than occupying the entry-level rung in NHTs stable. Overall, the SB1 is a very successful upgrade to the SuperZero, and is a much more complete speaker. Many of its competitors produce more bass weight, which does affect an unqualified recommendation. However, the NHT SB1 is a true audiophile speaker, and if you eventually upgrade it with a sub, you will have a full-range speaker system that will be eminently satisfying.